44mm 18K rose gold (5N) case, screw-down security crown crown, rubberized black unidirectional rotating bezel, sapphire crystal, black dial, Caliber UN-150 Self-winding movement with chronograph function, 30-minutes- 12-hours and small seconds registers, date, rubber strap with 18ct rose gold (5N) element, deployant buckle. 44mm 18K rose gold [5N] case, screw-down security crown crown, rubberized blue unidiretional rotating bezel, sapphire crystal, blue dial, Caliber UN-150 Self-winding movement with chronograph function, 30-minutes, 12-hours and small seconds registers, date, rubber strap with 18 ct rose gold [5N] elements, deployant buckle. 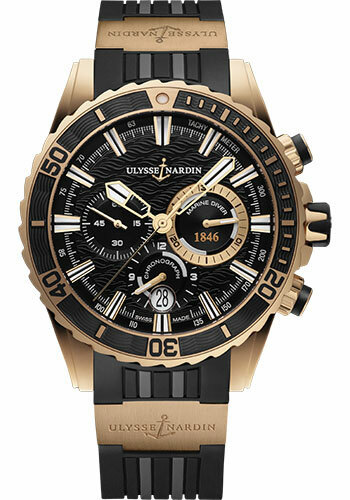 44mm 18K rose gold (5N) case, screw-down security crown crown, rubberized black unidirectional rotating bezel, sapphire crystal, black dial, Caliber UN-150 Self-winding movement with chronograph function, 30-minutes, 12-hours and small seconds registers, date, rubber strap with ceramic elements, deployant buckle.